Killed in action - shot by a sniper in the stomach. 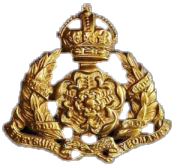 Regiment & Unit 'A' Squadron, Derbyshire Imperial Yeomanry, Notts & Derbyshire Mounted Brigade. Service details Egypt & Gallipoli. Parents names Mr George Alfred & Mrs Elizabeth Poyser. 5, Nethermoor Road, New Tupton. Helles memorial, Turkey, Panel 17. Any other information? Pre war occupation was a miner at Clay Cross Company, Avenue No. 9 pit. He was a former choir boy at St. John's church. Also connected to the church 'Lads' Brigade. A former Rechabite, he became a member of the Druids Society. Alfred Poyser is remembered on his parents gravestone in North Wingfield Churchyard. Given the information available, it is very possible that Alfred Poyser was was awarded the 1914-15 star campaign medal of the British Empire for his service in World War One. This Star is identical to the 1914 Star in every respect except that the centre scroll bears the dates “1914- 15” and the two small scrolls bearing “Aug” and “Nov” are omitted. He would also have received the British War Medal and Victory Medal, as it was not awarded singularly. These three medals were sometimes irreverently referred to as Pip, Squeak and Wilfred. With Pip representing either this medal or the 1914 Star, only one of which could be awarded to a soldier, Squeak represented the British War Medal and Wilfred represented the Victory Medal. Given the information available it is likely that Alfred Poyser was entitled to the Victory medal, also called the Inter Allied Victory Medal. This medal was awarded to all who received the 1914 Star or 1914-15 Star and, with certain exceptions, to those who received the British War Medal. It was never awarded alone. These three medals were sometimes irreverently referred to as Pip, Squeak and Wilfred. Eligibility for this award consisted of having been mobilised, fighting, having served in any of the theatres of operations, or at sea, between midnight 4th/5th August, 1914, and midnight, 11th/12th November, 1918. Women who served in any of the various military organisations in a theatre of operations were also eligible. 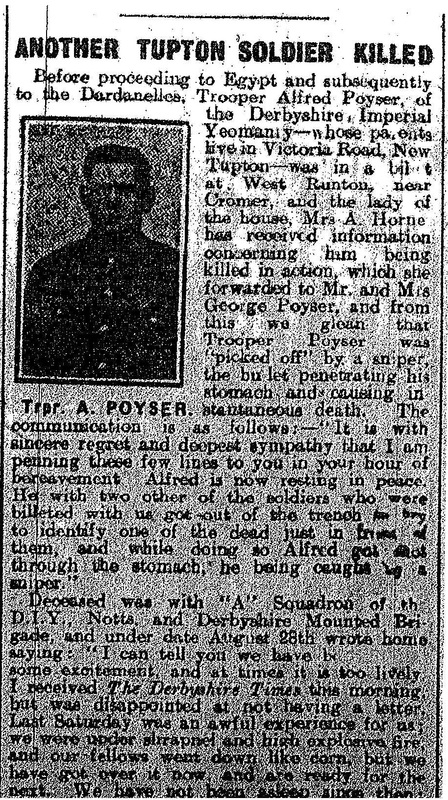 From the information available, it is very possible that Alfred Poyser was entitled to the British War Medal for service in World War One. This British Empire campaign medal was issued for services between 5th August 1914 and 11th November 1918. The medal was automatically awarded in the event of death on active service before the completion of this period.